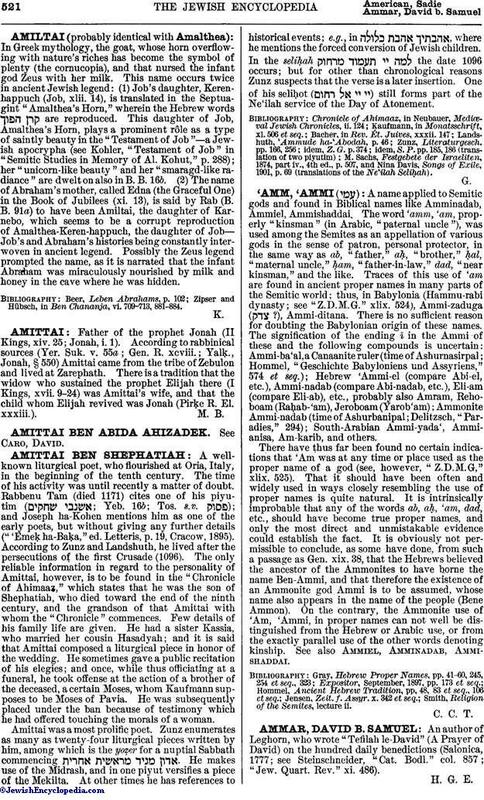 A name applied to Semitic gods and found in Biblical names like Amminadab, Ammiel, Ammishaddai. The word 'amm, 'am, properly "kinsman" (in Arabic, "paternal uncle"), was used among the Semites as an appellation of various gods in the sense of patron, personal protector, in the same way as ab, "father," aḦ, "brother," Ḧal, "maternal uncle," Ḧam, "father-in-law," dad, "near kinsman," and the like. Traces of this use of 'am are found in ancient proper names in many parts of the Semitic world; thus, in Babylonia (Hammu-rabi dynasty; see "Z.D.M.G." xlix. 524), Ammi-zaduga ( ? ), Ammi-ditana. There is no sufficient reason for doubting the Babylonian origin of these names. The signification of the ending ī in the Ammi of these and the following compounds is uncertain: Ammi-ba'al, a Canaanite ruler (time of Ashurnasirpal; Hommel, "Geschichte Babyloniens und Assyriens," 574 et seq. ); Hebrew 'Ammi-el (compare Abi-el, etc. ), Ammi-nadab (compare Abi-nadab, etc. ), Eli-am (compare Eli-ab), etc., probably also Amram, Rehoboam (RaḦab-'am), Jeroboam (Yarob'am); Ammonite Ammi-nadab (time of Ashurbanipal; Delitzsch, "Paradies," 294); South-Arabian Ammi-yada', Ammianisa, Am-karib, and others. There have thus far been found no certain indications that 'Am was at any time or place used as the proper name of a god (see, however, "Z.D.M.G," xlix. 525). That it should have been often and widely used in ways closely resembling the use of proper names is quite natural. It is intrinsically improbable that any of the words ab, aḦ, 'am, dad, etc., should have become true proper names, and only the most direct and unmistakable evidence could establish the fact. It is obviously not permissible to conclude, as some have done, from such a passage as Gen. xix. 38, that the Hebrews believed the ancestor of the Ammonites to have borne the name Ben-Ammi, and that therefore the existence of an Ammonite god Ammi is to be assumed, whose name also appears in the name of the people (Bene Ammon). On the contrary, the Ammonite use of 'Am, 'Ammi, in proper names can not well be distinguished from the Hebrew or Arabic use, or from the exactly parallel use of the other words denoting kinship. See also Ammiel, Amminadab, Ammishaddai. Smith, Religion of the Semites, lecture ii.